So I thought I’d give you guys a peek into the studio. I recently photographed it for the last Blogging Your Way course I co-taught alongside Holly from decor8 and Irene from Bloesem. We wanted to show students our workspaces and give them a glimpse into our work processes, which, for each of us, are conducted primarily from home. Lots has been happening here these past few months. It’s been turbo with new projects streaming in, working away at existing ones to get them wrapped up and featured on the blog, hosting workshops and also teaching. And though being able to do what I love from the comforts of my own home is such a privilege in itself, there are certainly days when I go a little stir crazy and therefore it’s become so important to me to make this space every bit as functional as it is pretty. 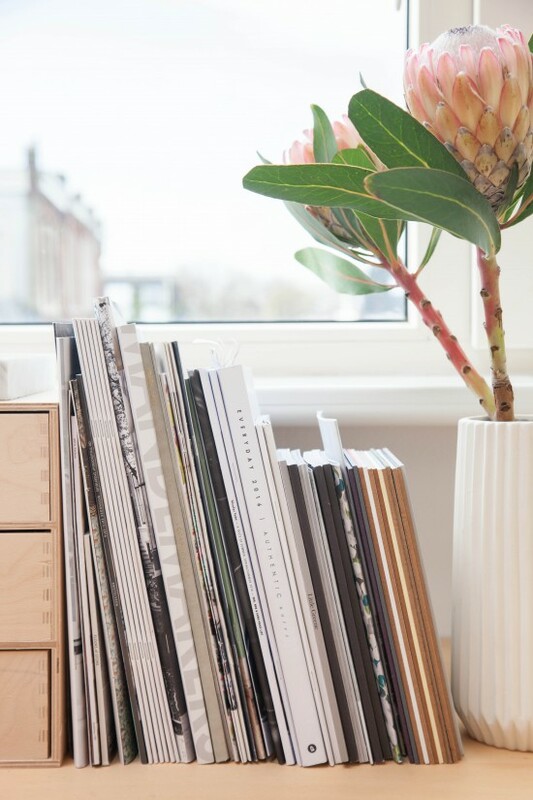 If you work from home, or would like to, and are in need of some new inspiration, here are my six steps to creating a fun, fresh and functional home office! I use this space – the third floor of my home – as an office, but it is also where I store props and interior accessories I gather for current shoots and projects. It is the place where blogging happens, any product styling and photography I’m working on, the place where my interns work four-five days a week, and also where workshops take place. It’s where I come to be inspired and most of all, productive. 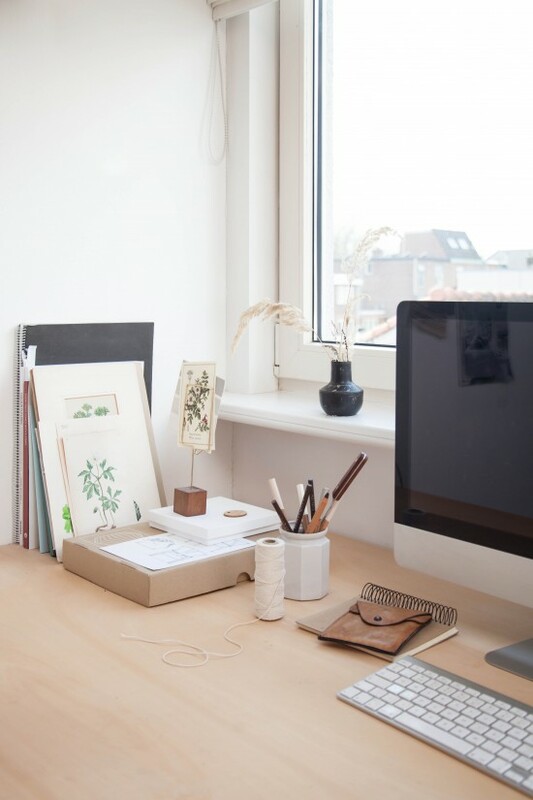 And though I am at home, I feel as if I am in my own domaine – separated enough from the rest of the house but close enough to still enjoy all the comforts of working from home. I posted a full studio tour on my blog last year with all the before and after images, so you may have already seen this space, but as my business has developed since then, I thought you wouldn’t mind another peek plus some tips too! A bit of a back story into this space and its design. 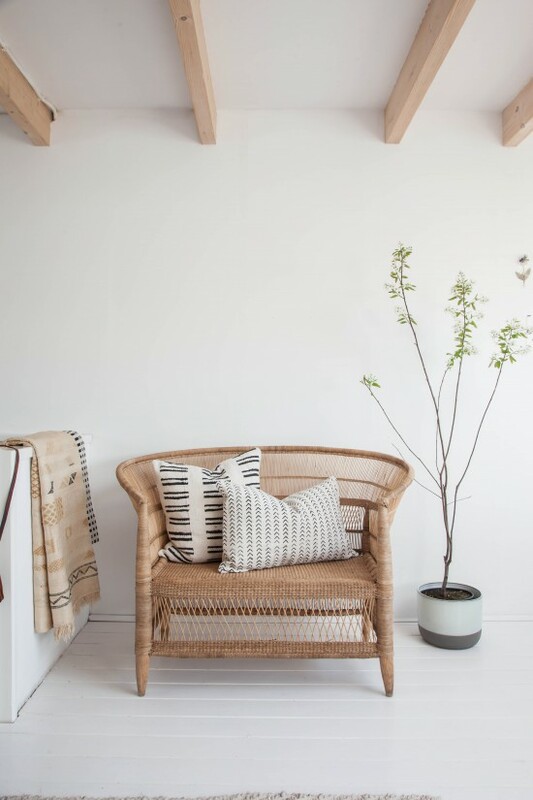 My studio is the third floor of my home and is a light and bright space that I kept primarily white with some gentle smatterings of muted colour thrown in that echo the Avenue Lifestyle brand identity. For it to be able to work effectively for me as an office and place of business, the space had to be visually very clean and uncluttered because clutter makes me nervous and I am quite the scatterbrain on a good day! Lots of practical factors came into play during the decorating because although it’s a part of my home, it is first and foremost my workspace and the main goal was versatility. You can read more about the design process and renovation of the space here. 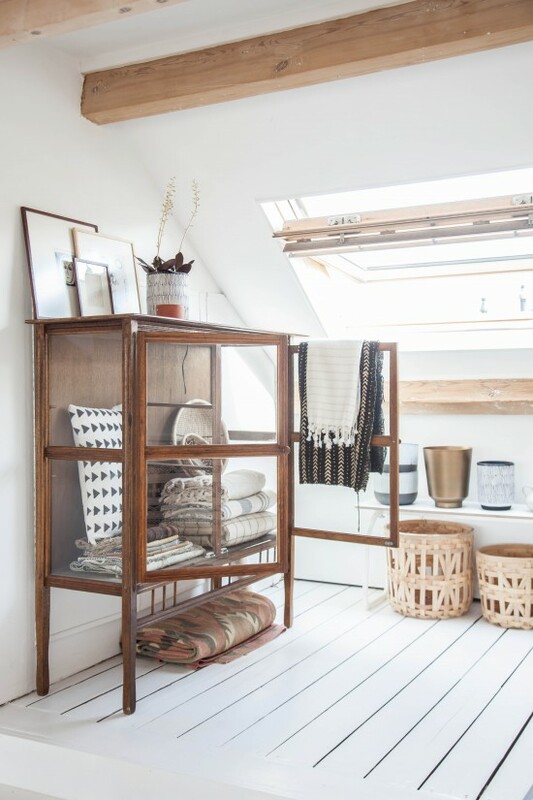 Storage is key to creating and maintaining a functional space. A lack of storage will lead to clutter and mess and that will, in turn, affect your focus. 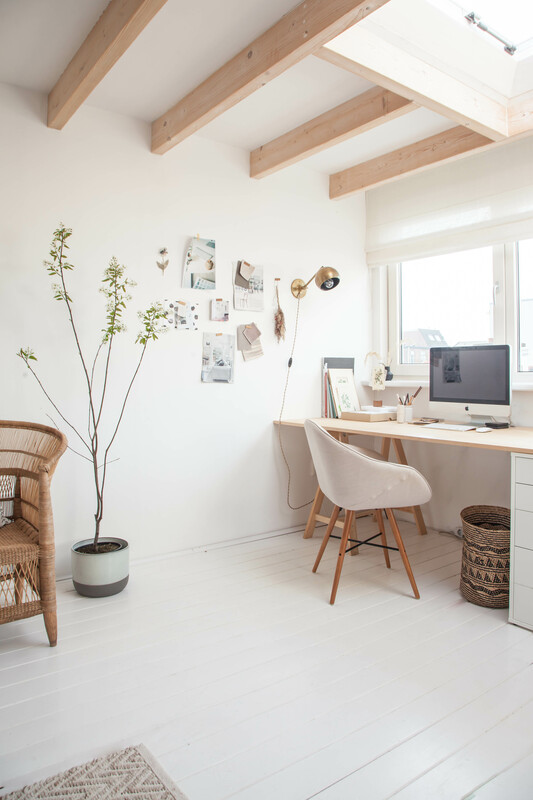 If you are designing a home office, start with your storage space, and then tackle the rest! 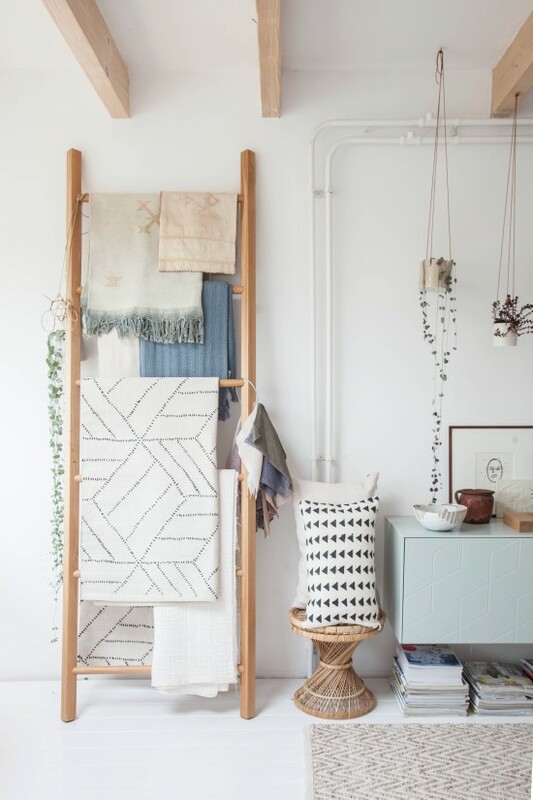 If you’re like me and have a weakness for textiles then you’ll know that proper storage for said textiles are a must. 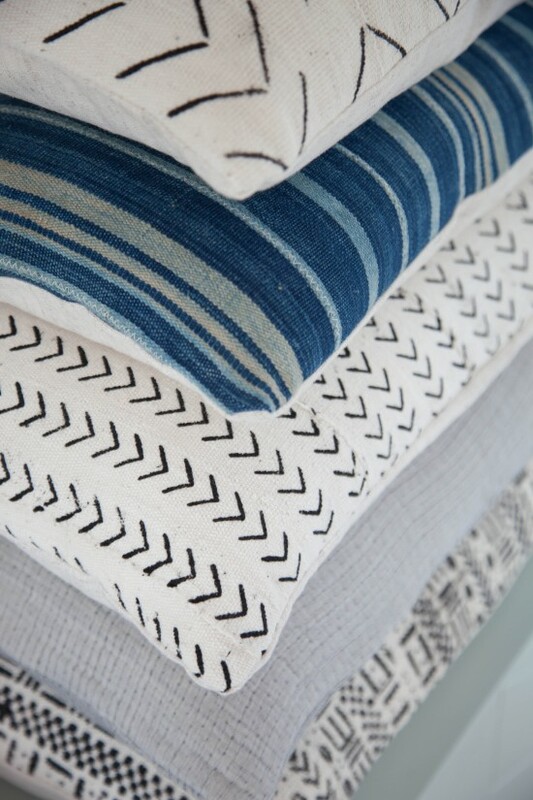 I love to see the rugs, blankets and samples I collect displayed. My oak leaning rack by Walden has become a favourite item in the studio for just that. 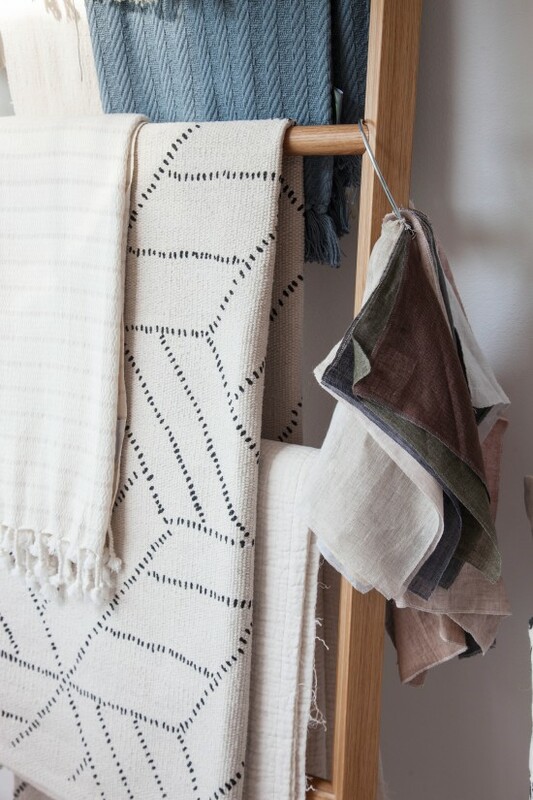 With a constant rotation of rugs and blankets that hang there before going to their next home, this rack has become a life-saver, not to mention a beautiful focal point in the room – as that area is the first thing I see when I enter the studio, it certainly makes for a pretty first impression! 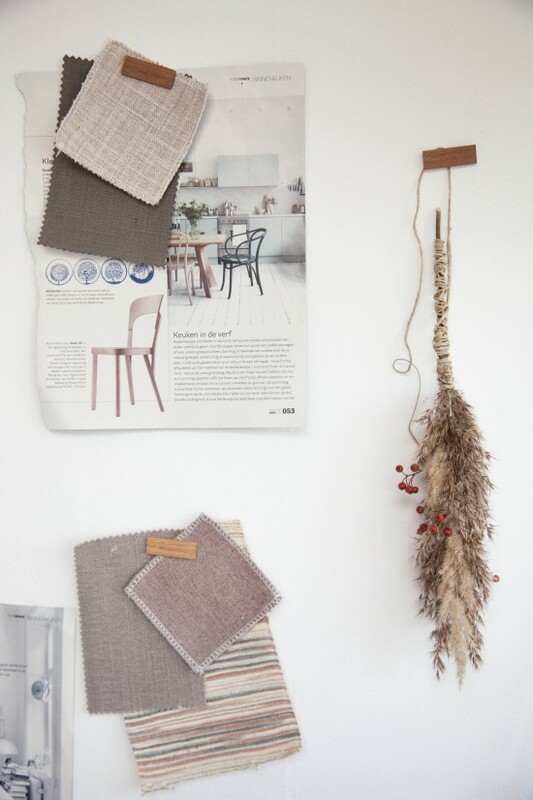 My curtain and upholstery fabric samples and By Mölle linen samples also live there. I’ll probably get another one of them in fact, because it’s so useful. Next week I’ll show you some of my favourite Walden products and we’ll also be running a giveaway! 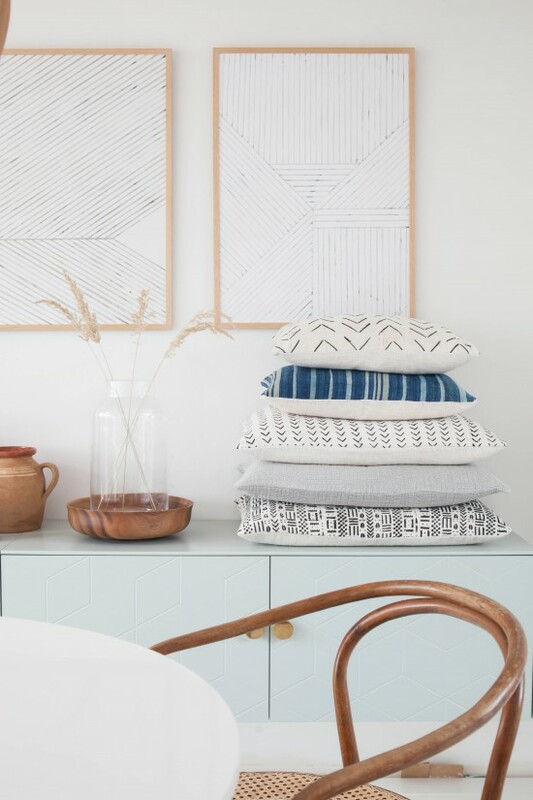 I also use a long sideboard – from Superfront – to hoard fabrics, curtains, brochures, samples, folders containing tax documents and other admin, and craft supplies I use for styled shoots. I use the top to display styling props – pillows, accessories for the home, art – that I have gathered for current projects and it is a constantly rotating display. 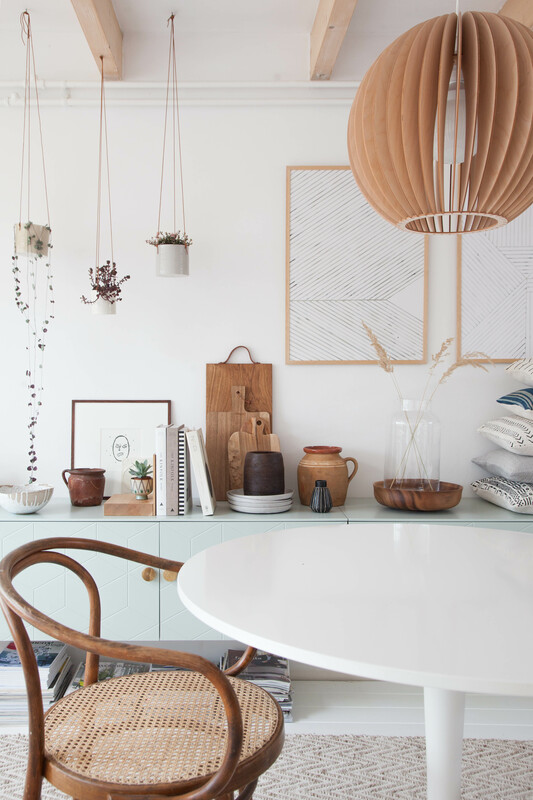 Featured here include watercolour prints by Silke Bonde, ceramics by Anne Black and various vintage finds I was collecting for a kitchen installation. Stuff comes in and stuff goes out, which means there’s always something lovely to look at! Underneath, I pile magazines in which my work has been featured. It is necessary, particularly for those of us who work creative careers, for the eye and mind to rest. It’s obviously very nice to decorate the walls with art and colour, but be sure to leave some white space, giving the eye some room to rest or your office might lead to information overload to the brain and distract you rather than entice you to be productive! 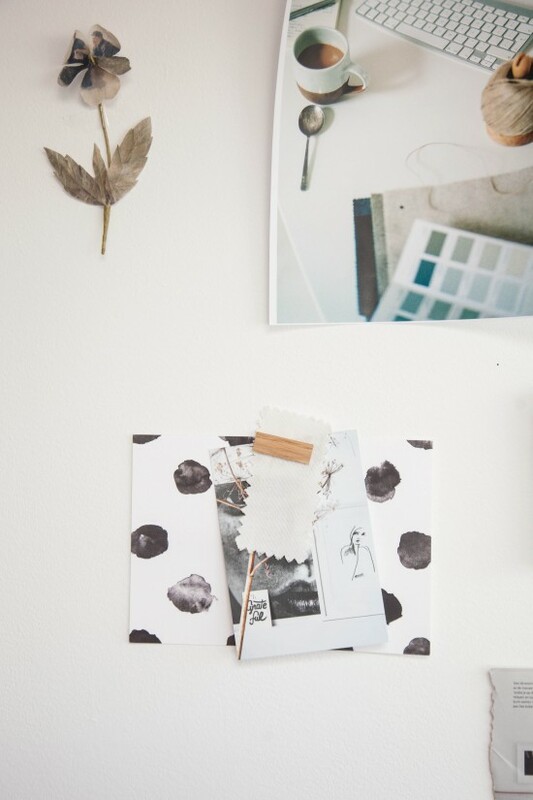 I use a small area next to my desk to pin and display magazine cuttings, fabric samples, favourite photographs and delicate dried flowers and objects to the wall beside my computer as inspiration but there’s ample white space to entertain my imagination too. 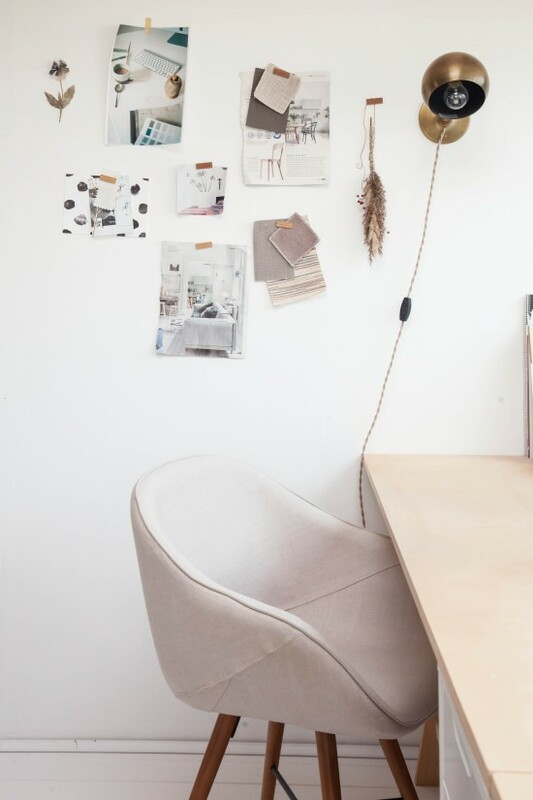 Make sure you have a well lit space to work from, preferably with plenty of natural light. Though I try to work only during the day up in my studio, I sometimes find myself sneaking up here in the evening to get a few things done in busy periods. Good lighting is therefore really important. I have two desk lamps on either end of the desk as task lighting and a ceiling fixture over the meeting table that sufficiently lights the whole room at night. My brass wall sconce is from Schoolhouse Electric. The central light fixture is by IUMI and the brass and glass lamp on my desk is by House Doctor. As you grow your business you will need to have a large enough desk surface to spread out on without feeling cramped. Plus, you might have assistants or interns and they will need to sit somewhere so if you can, calculate some extra desk space onto your home office design plans. I created a simple desk out of two sheets of multiplex wood. I used trestle legs on either end of the desk and two ‘Billy’ cabinets from Ikea to support the centre. The table leaves can be easily removed when needed so it’s a very practical option for me. Often, on days I am at home with my daughter, I work on the left and Lola plays and does art on the right side and it works well. On a normal day, I sit on my side and my intern works on the other with her laptop. On my desk, there’s a printer (not the prettiest accessory but I’d be lost without it!) and a little wooden storage unit I picked up from Ikea that has three drawers I use to store paint cards, receipts and magazine contracts in. In the drawers under my desk, I store stationary, user manuals, envelopes and other bits and pieces. And Lola has a drawer for herself with art supplies for when she is ‘working’ up here with mama. I try to keep my desk top as uncluttered as possible to avoid distraction. As the desk is situated in front of a big window, a lot of light pours in and can be a bit overwhelming. I have roman blinds that offer solace from the bright light during the summer and have also ben known to drape a piece of cotton gauze over the skylight to defuse the light a bit. 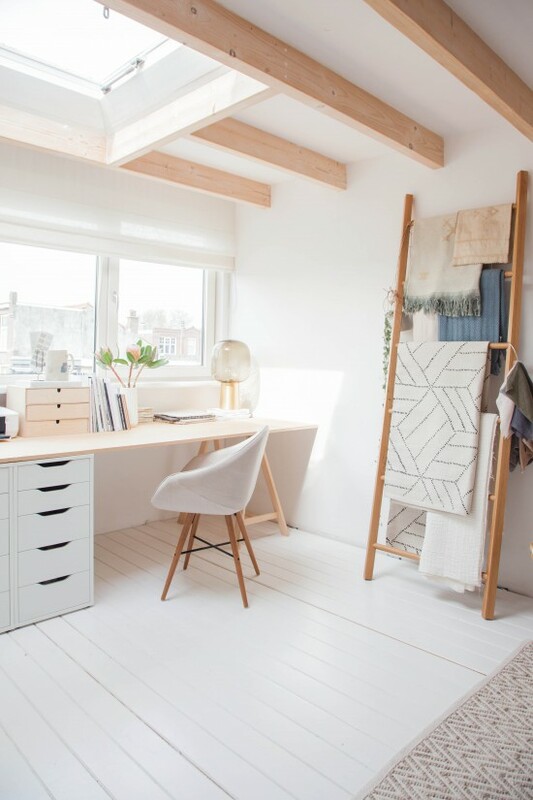 This is certainly a luxury particularly if you’re short on space, but where you can, try to create an area in your workspace that is flexible so that you can shuffle things around depending on your activities and always have a degree of flexibility in your space. 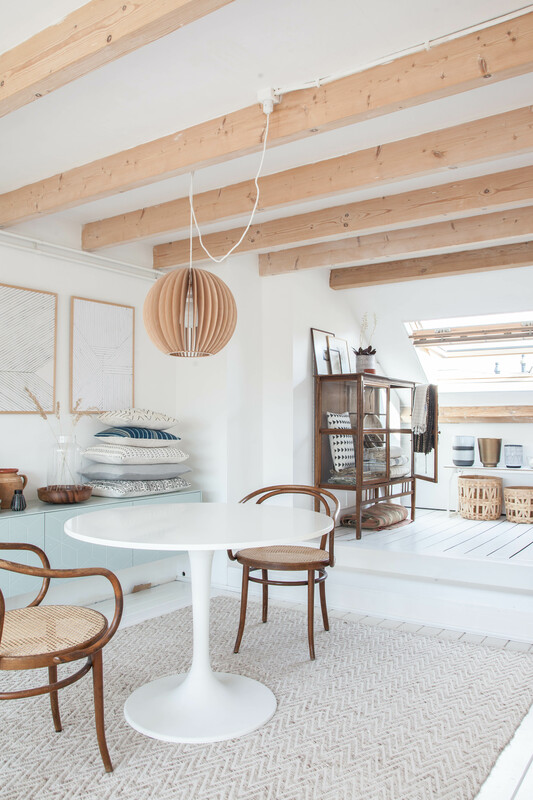 For me, the area above where I have a table and two chairs and the platform beyond that is an area that is flexible enough so that if I have a workshop happening up here or a photo shoot, it can be swiftly moved out of the way. The area on the platform to the right of the seating area is where I house props and styling objects. I use a beautiful old vintage vitrine dresser as a display cabinet for things that can be folded and stowed away but bulkier items (such as large boxes containing furniture are stacked neatly or stowed away in the storage room under the eaves. The cupboards under the eaves need to be accessed freely so I have kept the platform relatively empty, though there are weeks when it is piled high with props and inventory – chairs I can’t stop collecting, furniture that needs new reupholstery, vintage pieces that need some work doing to them and excess inventory from wholesale purchases. Sometimes that’s just the name of the game and you have to be flexible! While there may be days where silence is necessary for concentration, it’ so nice to work away to your favourite tunes playing in the background. I’m a Spotify girl myself, playing anything from Angus & Julia Stone to Alanis Morrisette to Sia during office hours and I have been known to outright get up and dance. My interns look at me as if I am slightly nuts but it boosts morale and keeps things lively and fun! So that’s the studio! Most of the product in here has already made it’s way to projects I’ve been working on, there’s a constant rotation of props. Each week there are new pillows or ceramics, which are then replaced by other pretty things. To be honest, I am growing out of this space a bit. The storage space is full up and I am running out of space to put the overflow of product that comes in when I for example, buy vintage pieces that need work done to them before I can place them on a project or when I buy wholesale (which often means I have 2 to 4 of the same thing – one on display and the rest in boxes waiting from the perfect room to be placed in). So behind this pretty cabinet there’s a pile of boxes that seems to be growing each week. What to do! Hope you enjoyed this little studio tour. I always love seeing where my favourite bloggers work, so I figured you’d appreciate a studio update. And if I have inspired some of you who also work from home (or want to) then I am a happy lady. Feel free to ask any questions in the comments section below. What a stunning space!! May I ask where the 3 cutting boards are from? Thank you! I would love to know where you sourced the oversized wicker chair from!? Please! 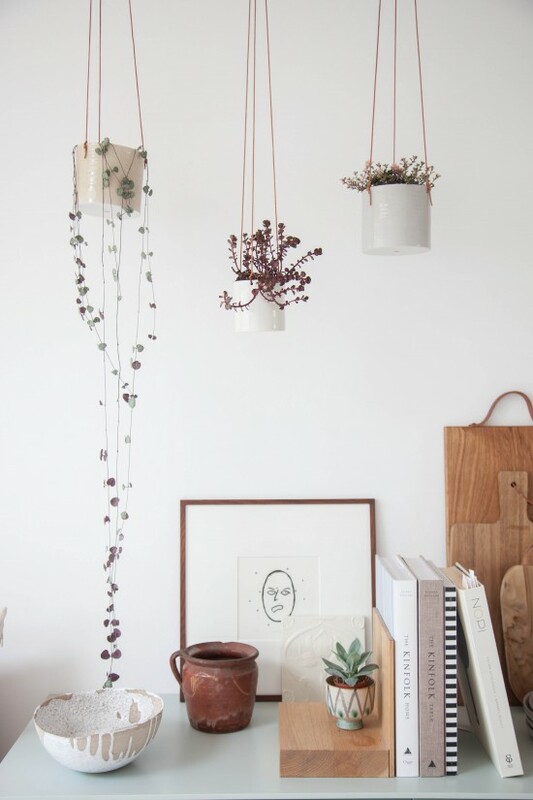 This space is gorgeous, I love every element – so thoughtfully placed. Where did you get that cabinetry, with the glass doors? It’s incredible. Thank you! Hi there! I love your space. How serene and inspiring. I am wondering where you sourced the light mint floating cabinets? I would love them for our new living room. Thank you! I love the color and texture in this space! Where are the geometric prints over the floating credenza from? I’m looking for something similar for my new apartment. I love that they’re graphic but still soft. Thanks! Were is this simple book support (book end)on 3rd picture? 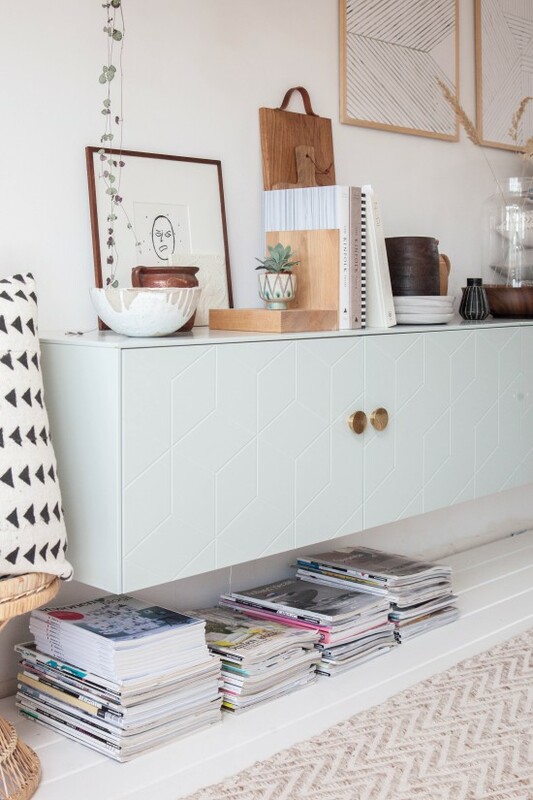 I’m obsessed with the mint green piece – where is it from?? Hi Alexis, the floating sideboard is made up of cabinets from IKEA (BESTA) with doors, top, sides and handles from Superfront. Hi! Beautiful space and functional! Where did you get the rug? Beautiful! Where are the chairs from? What is the size of the lamp? There are three sizes on the website. I would love to know where the over sized wicker chair is from? I have been hunting from one of these!! That oversized wicker chair is my dream chair for my nursery I’m setting up.. holly where did this come from ? ? I’m a little late to the party with this post, but I wondered if you could tell me where the upholstered Eamesy chairs are from? The long table/ desk supported by the billy cabinet is great. Beautiful! Where are those wooden book-ends from? This room is so calming with all the natural colours and textures. I love it! It’s inspired me to freshen up my home office. I was wondering if you could let me know where the plant pot is from that has the small tree in it? Looking for something similar. Can you source the 2 linear pieces of white wall art above the credenza. Hey Holly! I saw the image with the wicker loveseat on Pinterest and I love everything about the photo! My husband and I are about to paint our house & are looking for the perfect color. We both love the color of the walls in your workspace. Do you mind sharing what paint color you used? 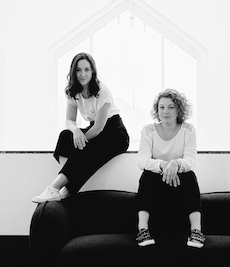 What a lovely and inspiring studio, Holly. I’m in process of shifting my Atelier from a small dining nook to a larger Area in my living room, and love your six steps/ properties to consider. i am in love with your DIY desk and hoping to make this set with just 1 wooden tabletop for the desk. Can you please tell me where you found the wood trestle? I saw some trestle legs from Ikea that are wood and painted black. Do you suggest me sanding down the black color and staining these legs? Thank you! Love your blog!! What a beautiful space! I too love the soft green of the floating ikea cabinet. I particularly the the fabrics of the cushions on that cabinet. The blue striped fabric and the arrow prints and geometric print on the bottom. Would you be so kind to tell me where you sourced these from? Hi! Such lovely spaces! 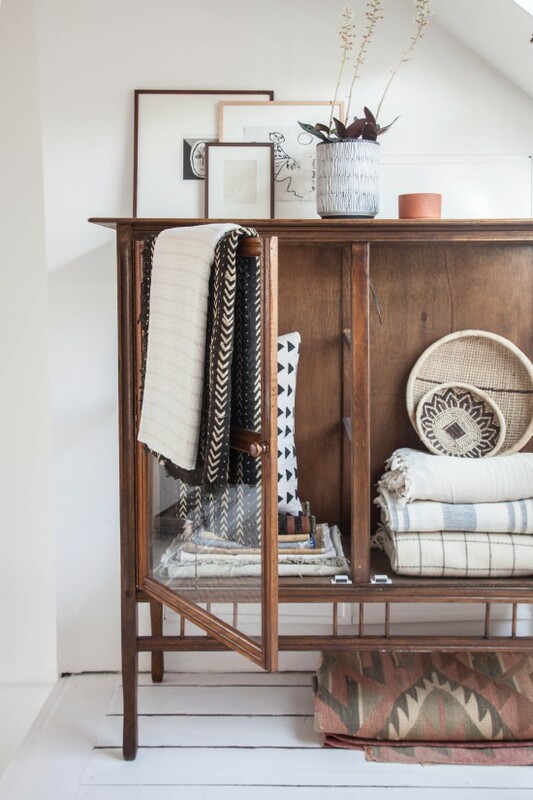 I keep coming across the pictures of the glass cabinet on different sites, and I cannot get over the folded rug underneath it. What is is, and where did you find it?